This book is sort of a compilation of Hough’s “Proficient Motorcycling” (see the wBW Review of Proficient Motorcycling), which is itself a compilation of the excellent series of articles Hough writes for Motorcycle Consumer News and other periodicals. 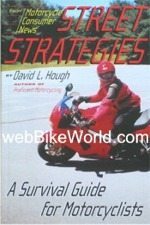 Street Strategies seems to repeat some of the information, but this book, in its smaller format, might be more useful to those who just want to brush up on the lessons learned in Proficient Motorcycling. My advice is to purchase Proficient Motorcycling; every motorcyclist should have that book. Purchase this one also to get a few more tips or if you just need a reference. The short chapters have titles like “Groovy Surprises”, “Neighborhood Dogs”, “Parking Lot Darters” and more,. each reflecting the type of information and techniques to learn. There are a total of 73 chapters; some are as short as one page and others are longer. There are minimal black and white photos and line drawings, but the text and the lessons are what’s important.